This KMZ file aggregates basic population and poverty demographics for the Zillow neighborhood boundaries. We used census block group data from the SF1 and SF3 file of the 2000 census. The map is color-coded by the percentage of the population living at or below the poverty level. Neighborhood boundaries are sorted by city and state in the sidebar. For faster display, the initial map shows Washington, DC only. Click boxes on the sidebar to display additional states. Use Ctrl-click on the map to display the population and poverty stats by neighborhood. Block groups are often split by neighborhood boundaries. For the population data by race and ethnicity, it is possible to develop more accurate estimates using block-level data from the SF1 file. However, for the poverty data, block groups represent the smallest unit reported by the Census Bureau. In a few instances (less than 1 percent), neighborhood estimates could not be derived due to topology errors when converting from the original source Zillow shapefiles. (This includes all of Wake County-Raleigh, NC). You can identify these discrepancies by overlaying the non-color-coded KMZ file posted in the previous entry. For more detail, remember that you can always overlay SF1 and SF3 datasets from gCensus as discussed in a previous post. The neighborhood boundaries are made available in shapefile format by Zillow.com under a Creative Commens License. The entire KMZ file is too large to display in Google Maps, but you can break it up into city-by-city KMZ files and save to Google My Maps. You'll also need to copy the legend to the state or city folder you have created. Here is something that might be useful for voter registration and GOTV efforts. 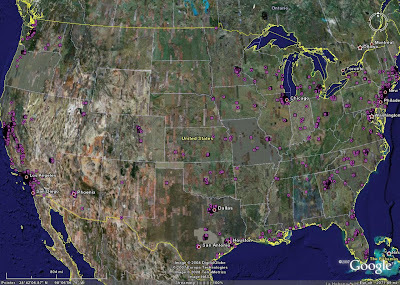 This Google Earth KMZ file contains boundaries for nearly 7,000 neighborhoods in 150 cities. The file is based on shapefiles released by Zillow.com yesterday. Additional details are posted on the Zillow Blog. Ctrl-Click on the map to display the city and region ID in addition to the neighborhood name. For faster load time, Google Earth initially displays boundaries and labels for Arizona only. Click on the sidebar boxes to display additional states. Labels are sorted by state and city in the sidebar. At some point, we may update the file to include socioeconomic data estimates from the SF3 file of the 2000 census. There are about 7 million Latino citizens in the U. S. who are not registered to vote. The table and chart in the figure below show that 5 million of the unregistered Latinos are ages 18 to 44 -- roughly half of the Latino citizen population for that age group. Over 95% of all Latino citizens who are not registered to vote live in areas defined by the census tracts identified in our previous post. This presents an enormous opportunity and challenge for civic engagement groups working in these areas. The aggregate number of unregistered Asian-American citizens (3 million) is not as high as the Latino unregistered citizen population, but the percent unregistered is across-the-board higher. This Google Earth KMZ file contains nearly 20,000 census tract centroids, representing all census tracts with an estimated 50 or more Latinos of voting age who are citizens as of July, 2006. These estimates can be used to help set targets for voter registration efforts in Latino neighborhoods. The tracts are sorted by state, county, and place. For faster load time, Google Earth initially displays Wisconsin only. Click on the sidebar boxes to display additional states. Use the gCensus web form found here to obtain tract boundaries in KMZ format for your areas of interest. No census tract in ME, NH, VT, or WV met the 50 person threshold. Citizenship rates are from the 2000 census. The Census Bureau does not provide citizenship estimates by ethnicity for areas smaller than a census tract. The 2006 citizen counts are adjusted to take into account population change. Source: Derived from 2000 Census SF 4 file and Caliper Corporation Time Series Data 2006. See also: Latino Registered Voters in CA by Precinct (2004). Unfortunately, we are unaware of publicly available information that would allow us to replicate this for states other than California. The Google Earth KMZ file depicted in the map below contains over 6,500 census tract centroids, representing all census tracts with an estimated 50 or more Asian-Americans of voting age who are citizens as of July, 2006. These estimates can be used to help set targets for voter registration efforts in Asian-American neighborhoods. The tracts are sorted by state, county, and place. 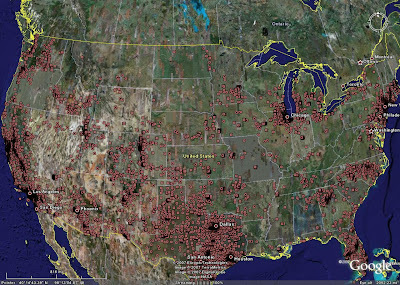 No census tract in ID, MT, ND, SD, WV, or WY met the 50 person threshold.